Now that you have determined the overall market direction of a currency, you can proceed and begin looking for trading opportunities. To determine where you will enter the pending order in the next step, you will first switch to the five minute chart and then wait for the price to briefly move against the overall market direction hoping for it to reverse back in the original direction with even greater force. First, switch to the five minute time frame. To decide how far back the price has to go against the overall market direction, we use the fractals again. 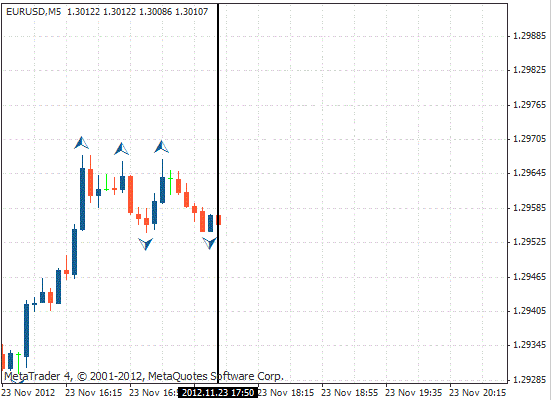 You need to wait for a 5 minute fractal in the opposite direction of the 30 minute market direction to be broken. Note that this can take any time from 15 minutes up to 2 hours or longer. While you wait for this fractal to form and break, the overall market direction on the 30 minute chart can change. 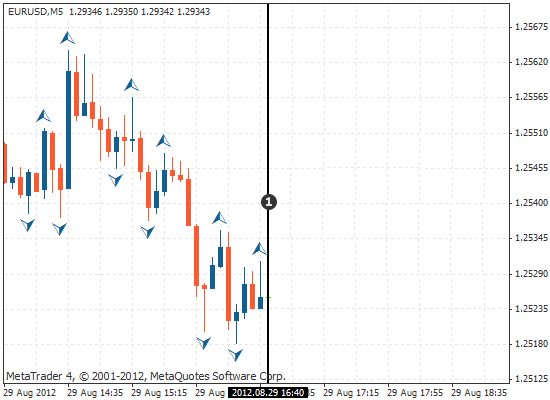 You should keep checking the market direction every 30 minutes and if it does change, go back to the first step. Once you have switched to the five minute time frame, place a vertical line on the last candle of your chart, as shown in the chart below. You will not use anything that comes before, or to the left of, this vertical line. 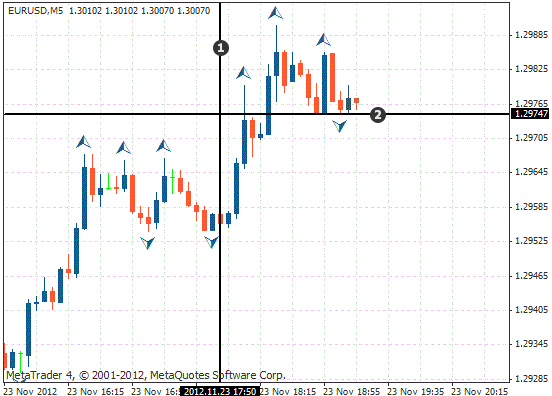 You will be waiting for the trade to set-up after, or to the right of the vertical line. You should now wait for a down fractal to form and then break in order to find your trading opportunity and move to the next step. Until the break of the down fractal, you can completely ignore any up fractal that may form. The chart below shows that the next candle after the vertical line has a down fractal. Place a line at the bottom of this candle — you will wait for price to break this line. 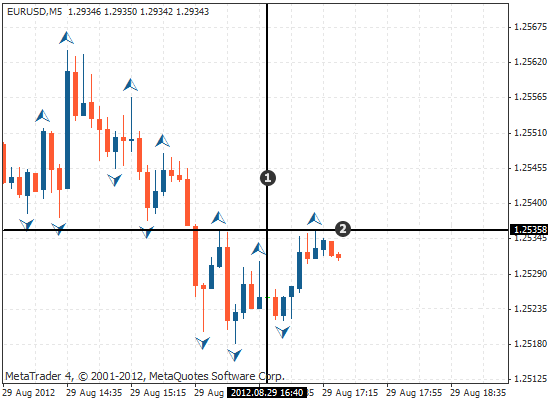 After the formation of the down fractal, you should wait for price to break the horizontal line you have drawn. If a new down fractal forms before the previous one is broken, wait until that fractal is confirmed and then move your horizontal line to the new down fractal and wait for this fractal to be broken. In the following chart, price breaks the level of the down fractal. 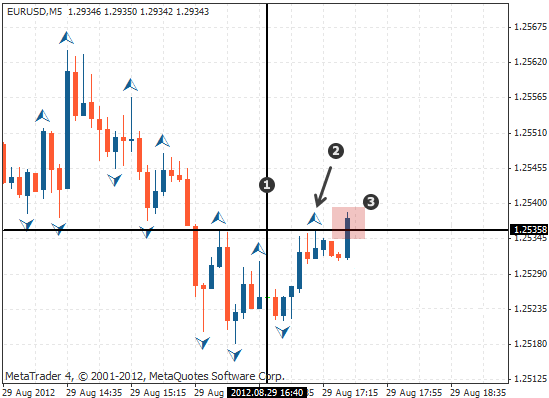 Immediately when price breaks through, you are ready to move to the next step to enter your pending order. See next lesson. Once you have switched to the five minute time frame, place a vertical line on the last candle of your chart, as shown in the chart below. You will not use anything that comes before, or to the left of, this vertical line. 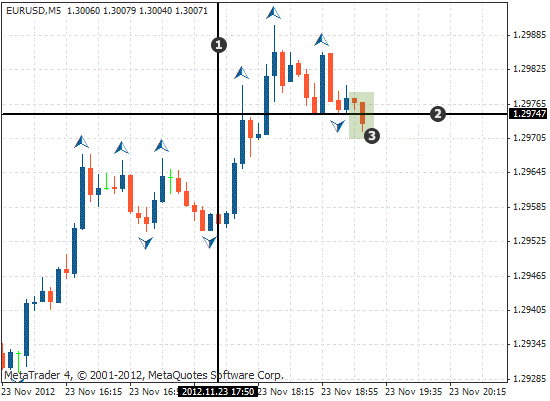 You will be waiting for the trade to set-up after, or to the right of, the vertical line. You should now wait for an up fractal to form — it is the up fractal that needs to be broken before you can find your trading opportunity. Until the break of an up fractal, you can ignore any down fractals that may form. The chart below shows that the next candle after the vertical line has an up fractal. Place a line at the top of this candle — you will wait for price to break this line. After the formation of the up fractal, you should wait for price to break the horizontal line you have drawn. If a new up fractal forms before the previous one is broken, wait until that fractal is confirmed and then move your horizontal line to the new up fractal and wait for this fractal to be broken. In the following chart, price breaks the level of the up fractal.